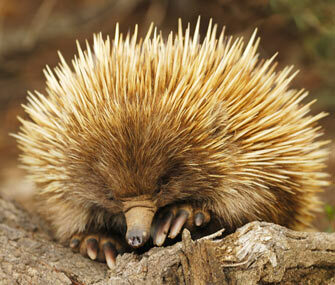 Echidnas, sometimes known as spiny anteaters, belong to the family Tachyglossidae in the monotreme order of egg-laying mammals. The four extant species, together with the platypus, are the only surviving members of the order Monotremata, and are the only living mammals that lay eggs. 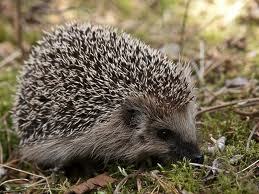 A Hedgehog is any of the spiny mammals of the subfamily Erinaceinae, in the eulipotyphlan family Erinaceidae. There are seventeen species of hedgehog in five genera found through parts of Europe, Asia, and Africa, and in New Zealand by introduction. By the way, what's the difference between a rabbit and a bunny? Rabbits are small mammals in the family Leporidae of the order Lagomorpha (along with the hare and the pika). Oryctolagus cuniculus includes the European rabbit species and its descendants, the world's 305 breeds of domestic rabbit. Sylvilagus includes 13 wild rabbit species, among them the 7 types of cottontail. The European rabbit, which has been introduced on every continent except Antarctica, is familiar throughout the world as a wild prey animal and as a domesticated form of livestock and pet. With its widespread effect on ecologies and cultures, the rabbit (or bunny) is, in many areas of the world, a part of daily life - as food, clothing, a companion, and as a source of artistic inspiration. Hares and jackrabbits are leporids belonging to the genus Lepus. 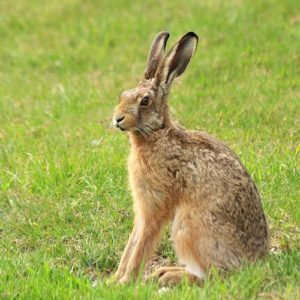 Hares are classified in the same family as rabbits. They are similar in size and form to rabbits and have similar herbivorous diets, but generally have longer ears and live solitarily or in pairs. Also unlike rabbits, their young are able to fend for themselves shortly after birth (precocial) rather than emerging blind and helpless (altricial). Most are fast runners. Hare species are native to Africa, Eurasia, North America, and the Japanese archipelago. Scandinavia, region of N Europe. It consists of the kingdoms of Sweden, Norway, and Denmark; Finland and Iceland are usually considered part of Scandinavia. Physiographically, Denmark belongs to the North European Plain rather than to the geologically distinct Scandinavian peninsula (which is part of the ancient Baltic Shield), occupied by Norway and Sweden. Sometimes the word "Norden" is applied to the five countries because it avoids the physiographic and cultural limitations of the word Scandinavia. The Scandinavian peninsula (c.300,000 sq mi/777,000 sq km) is c.1,150 mi (1,850 km) long and from 230 to 500 mi (370–805 km) wide and is bordered by the Gulf of Bothnia, the Baltic Sea, the Kattegat and Skagerrak straits, the North Sea, the Atlantic Ocean, and the Arctic Ocean. It is mountainous in the west (rising to 8,104 ft/2,470 m at Glittertinden, S Norway) and slopes gently in the east and the south. The region was heavily glaciated during the Ice Age; Jostedalsbreen (W Norway), the largest glacier of mainland Europe, is a remnant of the great ice sheet. The peninsula's western coast is deeply indented by fjords. Short, swift-flowing streams drain to the west, while long parallel rivers and numerous lakes are found in the east; Vänern and Vättern, both in S Sweden, are among Europe's largest lakes. Nearly a quarter of the peninsula lies N of the Arctic Circle, reaching its northernmost point in Cape Nordkyn, Norway. The climate varies from tundra and subarctic in the north, to humid continental in the central portion, and to marine west coast in the south and southwest. The region's best farmland is in S Sweden. The peninsula is rich in timber and minerals (notably iron and copper), and has a great hydroelectricity generating capacity. Its coastal waters are important fishing grounds. Large petroleum and natural-gas deposits have been found off Norway's coast in the North Sea and the Atlantic Ocean. Population is concentrated in the southern part of the peninsula; Stockholm and Göteborg (both in Sweden) and Oslo (Norway) are the largest cities. Except for the Sami (Lapps) and Finns in the north and east, the Scandinavian peoples speak a closely related group of Germanic languages—Norwegian, Danish, Icelandic, Faeroese, and Swedish. The oldest Germanic literature (see Old Norse literature) flourished in Scandinavia, especially in Iceland. Historical writing of the 11th and 12th cent. is also noteworthy. In this field Snorri Sturlusoncontributed his Heimskringla. Ari Thorgilsson produced Islendingabók (c.1125), an account of the island's history, an abridged version of which has survived. He was probably partly responsible also for the Landnámabók, a topographical and genealogical account of Iceland; other works by Thorgilsson have been lost. Finally, all the Scandinavian countries produced medieval ballads, but these were not written down until much later. There remain numerous unsolved problems concerning oral composition, transmission of origins and influences, and dating. (Scandinavia is a region in Northern Europe, with strong historical, cultural, and linguistic ties. The term Scandinavia in local usage covers the three kingdoms of Denmark, Norway, and Sweden. The majority national languages of these three, belong to the Scandinavian dialect continuum, and are mutually intelligible North Germanic languages. In English usage, Scandinavia also sometimes refers to the Scandinavian Peninsula, or to the broader region including Finland and Iceland, which is always known locally as the Nordic countries. With its widespread effect on ecologies and cultures, the rabbit (or bunny) is, in many areas of the world, a part of daily life - as food, clothing, a companion, and as a source of artistic inspiration. So, rabbit and bunny are synonymous? So it's not exactly synonymous, then. It's either A child term for a rabbit or a term for a child rabbit. Not synonymous, but almost the same, depending on the context. Guava, (Psidium guajava), small tropical tree or shrub of the family Myrtaceae, cultivated for its edible fruits. Guava trees are native to tropical America and are grown in tropical and subtropical areas worldwide. Guava fruits are processed into jams, jellies, and preserves and are common pastry fillings. Fresh guavas are rich in vitamins A, B, and C; they are commonly eaten raw and may be sliced and served with sugar and cream as a dessert. The common guava has quadrangular branchlets, oval to oblong leavesabout 7.6 cm (3 inches) in length, and four-petaled white flowers about 2.5 cm (1 inch) broad. The fruits are round to pear-shaped and measure up to 7.6 cm in diameter; their pulp contains many small hard seeds (more abundant in wild forms than in cultivated varieties). The fruit has a yellow skin and white, yellow, or pink flesh. The musky, at times pungent, odour of the sweet pulp is not always appreciated. Propagation is usually by seeds, but improved varieties must be perpetuated by plant parts. The plant’s hard dry wood and thin bark prevent cutting and conventional methods of grafting. Veneer grafting, using as rootstocks young plants in vigorous growth, gives excellent results. The plant is not frost-resistant but is successfully grown throughout southern Florida; in several tropical regions it grows so abundantly in a half-wild state as to have become a pest. The cattley, or strawberry, guava (Psidium cattleianum) is considerably more frost-resistant than the common guava. It occurs in two forms: one has fruits with a bright yellow skin, and the other has fruits with a purplish red skin. The plant is a large shrub with thick glossy green oval leaves and white flowers. The fruits are round, up to 5 cm (2 inches) in diameter, and contain many hard seeds. The soft pulp has a strawberry-like flavour. This species is frequently planted in gardens throughout southern California and other subtropical regions but is not commercially important. Other guavas include the cás, or wild guava, of Costa Rica (P. friedrichsthalianum) and the guisaro, or Brazilian guava (P. guineense), both of which have acidic fruits. The so-called pineapple guava, or feijoa (Acca sellowiana), is an unrelated species. Guava is a common tropical fruit cultivated in many tropical and subtropical regions. Psidium guajava (common guava, lemon guava) is a small tree in the myrtle family (Myrtaceae), native to Mexico, Central America, and northern South America. Although related species may also be called guavas, they belong to other species or genera, such as the "pineapple guava" Acca sellowiana. In 2011, India was the largest producer of guavas. Another term for guavas is peru, derived from pear. It is common in countries bordering the western Indian Ocean and probably derives from Spanish or Portuguese. In parts of the Indian subcontinent and Middle-East, guava is called amrood, possibly a variant of armoot meaning "pear" in the Arabic and Turkish languages. It is known as the payara in Bangladesh. It is known as bayabas in the Philippines. Official world production data for guava are not available. In 2011, one source reported that India was the world production leader with 17.6 million tonnes, an amount not exceeded by the cumulative total of the next seven largest guava producers (table). According to the National Horticulture Board of India, guava ranks fourth among the commercially important fruits of India. In Mexico and other Latin American countries, the guava-based beverage agua fresca is popular. The entire fruit is a key ingredient in punch, and the juice is often used in culinary sauces (hot or cold), ales, candies, dried snacks, fruit bars, and desserts, or dipped in chamoy. Pulquede guava is a popular alcoholic beverage in these regions. In many countries, guava is eaten raw, typically cut into quarters or eaten like an apple, whereas in other countries it is eaten with a pinch of salt and pepper, cayenne powder or a mix of spices (masala). It is known as the winter national fruit of Pakistan. In the Philippines, ripe guava is used in cooking sinigang. Guava is a popular snack in Taiwan, sold on many street corners and night markets during hot weather, accompanied by packets of dried plum powder mixed with sugar and salt for dipping. In east Asia, guava is commonly eaten with sweet and sour dried plum powder mixtures. Guava juice is popular in many countries. The fruit is also often included in fruit salads. Phaseolus vulgaris, also known as the common bean, green bean and French bean, among other names, is a herbaceous annual plant grown worldwide for its edible dry seeds or unripe fruit (both commonly called beans). The main categories of common beans, on the basis of use, are dry beans (seeds harvested at complete maturity), snap beans (tender pods with reduced fibre harvested before the seed development phase) and shell (shelled) beans (seeds harvested at physiological maturity). Its leaf is also occasionally used as a vegetableand the straw as fodder. Its botanical classification, along with other Phaseolus species, is as a member of the legume family Fabaceae, most of whose members acquire the nitrogen they require through an association with rhizobia, a species of nitrogen-fixing bacteria. The common bean is a highly variable species that has a long history of cultivation. All wild members of the species have a climbing habit, but many cultivars are classified either as bush beans or dwarf beans, or as pole beans or climbing beans, depending on their style of growth. These include the kidney bean, the navy bean, the pinto bean, and the wax bean. The other major types of commercially grown bean are the runner bean (Phaseolus coccineus) and the broad bean (Vicia faba). Beans are grown on every continent except Antarctica. Worldwide, 27 million tonnes of dried beans and 24 million tonnes of green beans were grown in 2016. In 2016, Myanmar was the largest producer of dried beans, while China produced 79% of the world total of green beans. The wild P. vulgaris is native to the Americas. It was originally believed that it had been domesticated separately in Mesoamerica and in the southern Andes region, giving the domesticated bean two gene pools. However, recent genetic analyses show that it was actually domesticated in Mesoamerica first, and traveled south, probably along with squash and maize (corn). The three Mesoamerican crops constitute the "Three Sisters" central to indigenous North American agriculture. The common bean is a highly variable species with a long history. Bush varieties form erect bushes 20–60 cm (8–20 in) tall, while pole or running varieties form vines 2–3 m (7–10 ft) long. All varieties bear alternate, green or purple leaves, which are divided into three oval, smooth-edged leaflets, each 6–15 cm (2–6 in) long and 3–11 cm (1–4 in) wide. The white, pink, or purple flowers are about 1 cm long, and they give way to pods 8–20 cm (3–8 in) long and 1–1.5 cm wide. These may be green, yellow, black, or purple in color, each containing 4–6 beans. The beans are smooth, plump, kidney-shaped, up to 1.5 cm long, range widely in color, and are often mottled in two or more colors. As the name implies, snap beans break easily when the pod is bent, giving off a distinct audible snap sound. The pods of snap beans (green, yellow and purple in colour) are harvested when they are rapidly growing, fleshy, tender (not tough and stringy), bright in colour, and the seeds are small and underdeveloped (8 to 10 days after flowering). Raw or undercooked beans contain a toxic protein called phytohaemagglutinin. The three commonly known types of green beans are: string or snap beans, which may be round or have a flat pod; stringless or French beans, which lack a tough, fibrous "string" running along the length of the pod; and runner beans, which belong to a separate species, Phaseolus coccineus. 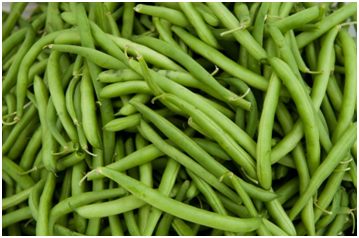 Green beans may have a purple rather than green pod, which changes to green when cooked. Wax beans are P. vulgaris beans that have a yellow] or white pod. Wax bean cultivars are commonly grown; the plants are often of the bush or dwarf form. The nuña is an Andean subspecies, P. v. subsp. nunas (formerly P. vulgaris Nuñas group), with round, multicolored seeds that resemble pigeon eggs. When cooked on high heat, the bean explodes, exposing the inner part, in the manner of popcorn and other puffed grains. Some scientists have proposed Mesoamerica as a possible origin for the common bean. Scientists disagree over whether the common bean was a product of one or multiple domestication events. Over time two diverse gene pools emerged: the Andean gene pool from Southern Peru to Northwest Argentina and the Mesoamerican gene pool between Mexico and Colombia. Phytohaemagglutinin can be deactivated by cooking beans for ten minutes at boiling point (100 °C, 212 °F). Insufficient cooking, such as in a slow cooker at 80 °C/ 176 °F, however, is not sufficient to deactivate all toxin To safely cook the beans, the U.S Food and Drug Administration recommends boiling for 30 minutes to ensure they reach a sufficient temperature for long enough to completely destroy the toxin. For dry beans, the FDA also recommends an initial soak of at least 5 hours in water which should then be discarded. Outbreaks of poisoning have been associated with cooking kidney beans in slow cookers. The primary symptoms of phytohaemagglutinin poisoning are nausea, vomiting, and diarrhea. Onset is from one to three hours after consumption of improperly prepared beans, and symptoms typically resolve within a few hours. Consumption of as few as four or five raw, soaked kidney beans can cause symptoms. Canned red kidney beans, though, are safe to use immediately. Beans are high in purines, which are metabolized to uric acid. Uric acid is not a toxin as such, but may promote the development or exacerbation of gout. However, more recent research has questioned this association, finding that moderate intake of purine-rich foods is not associated with increased risk of gout. Citrus limetta , alternatively considered to be a cultivar of Citrus limon, C. limon 'Limetta', is a species of citrus, commonly known as mousambi, musambi, sweet lime, sweet lemon, and sweet limetta, it is a member of the sweet lemons. It is a cross between the citron(Citrus medica) and a bitter orange (Citrus × aurantium). It is native to southern regions of Iran and also cultivated in the Mediterranean Basin. • In Iran it is called Limu Shirin ( meaning “Sweet lemon” in Persian). • In North India, it is commonly called mousambi, mosambi, or musambi (in Hindi/Urdu and Marathi). • In East India, and Malayalam, Bathayi in Telugu, and sathukudi or sathukodi in Tamil. • In Nepali, it is called Mausam. • In Sindh it is known as mosami. • In France it is sometimes called bergamot; it should not be confused with Citrus bergamia, the Bergamot orange. It is a different fruit from the Palestinian sweet lime and from familiar sour limes such as the Key lime and the Persian lime. However, genomic analysis revealed it to be highly similar to the Rhobs el Arsa, and the two likely shared a common origin. C. limetta is a small tree up to 8 m (26 ft) in height, with irregular branches and relatively smooth, brownish-grey bark. It has numerous thorns, 1.5–7.5 cm (0.59–2.95 in) long. The petioles are narrowly but distinctly winged, and are 8–29 mm (0.31–1.14 in) long. Leaves are compound, with acuminate leaflets 5–17 cm (2.0–6.7 in) long and 2.8–8 cm (1.1–3.1 in) wide. Flowers are white, 2–3 cm (0.79–1.18 in) wide. Fruits are oval and green, ripening to yellow, with greenish pulp. The pith is white and about 5 mm (0.20 in) thick. 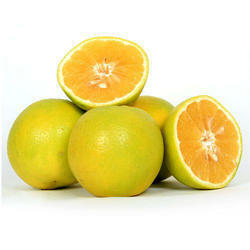 Despite the name sweet lime, the fruit is more similar to a greenish orange in appearance. C. limetta grows in tropical and subtropical climates. It begins bearing fruit at 5 to 7 years old, with peak production at 10 to 20 years. It is propagated by seed. As the name sweet lime suggests, the flavor is sweet and mild, but retains the essence of lime. The lime's taste changes rapidly in contact with air, and will turn bitter in few minutes, but if juiced and drunk rapidly the taste is sweet. The flavor is a bit flatter than most citrus due to its lack of acidity. It can be compared to limeade and pomelo. Sweet lime is almost exclusively served as juice, and is the most common available citrus juice in India, and Bangladesh. The juice is commonly sold at mobile road stalls, where it is freshly pressed, sometimes served with a salty chat masala or kala namak, unless the vendor is told not to add it. Like most citrus, the fruit is rich in vitamin C, providing 50 mg per 100 g serving. In Iran it is used to treat influenza and common cold. The tree is used for ornamental purposes as well as for graft stock. Underripe fruit feels light for its size, and is hard with tart flesh. Overripe fruit is dull and shrunken, with dry, spongy skin. Avoid fruit with brownish-yellow discoloration. Sweet limes keep fresh for up to two weeks at room temperature, and four to eight weeks refrigerated. Frozen juice will keep for up to six months. It is possible to freeze slices of the fruit, though the limonin content may cause the pulp to taste bitter over time. This can be avoided by submerging the slices in sweet syrup within an airtight glass jar. A potentiometer is a three terminal resistor in which the resistance is manually varied to control the flow of electric current. The potentiometer consists of three terminals among which two are fixed and one is variable. The two fixed terminals of the potentiometer are connected to both ends of the resistive element called track and third terminal is connected to the sliding wiper. The wiper that moves along the resistive element varies the resistance of the potentiometer. The resistance of the potentiometer is changed when the wiper is moved over the resistive path. The resistive element of the potentiometer is either flat or angled. If the resistive element is flat, the wiper moves linearly. On the other hand, if the resistive element is angled, the wiper moves in a rotary manner. The materials used to construct the resistive element of the potentiometer include carbon particles in plastic, graphite, resistive wires, and cermets (combination of ceramics and metals). Potentiometers are also sometimes referred as pots. Increasing or decreasing the resistance of the potentiometer controls the flow of electric current. If we increase the resistance of the potentiometer, large amount of electric current is blocked and only a small amount of electric current is allowed. On the other hand, if we reduce the resistance of the potentiometer, a large amount of electric current is allowed and only a small amount of electric current is blocked. If the wiper is adjusted in such a way that the resistive path is reduced, the resistance decreases, because the electric current has to travel only a small distance through the resistive path. On the other hand, if the wiper is adjusted in such a way that the resistive path is increased, the resistance increases, because the electric current has to travel a large distance through the resistive path. • Potentiometers are used to control volume in audio equipments, frequency attenuation, changing loudness, and changing other characteristics of audio signals. • Potentiometers are used in televisions and computers to control the picture contrast and brightness. Rheostat is a variable resistor, which is used to control the flow of electric current by manually increasing or decreasing the resistance. The English scientist Sir Charles Wheatstone coined the word rheostat, it is derived from the Greek word “rheos” and “-statis” which means a stream controlling device or a current controlling device. The electric current flowing through an electrical circuit is determined by two factors: the amount of voltage applied and the total resistance of the electrical circuit. If we reduce the circuit resistance, the flow of electric current through the circuit will be increased. On the other hand, if we increase the circuit resistance, the flow of electric current through the circuit will be decreased. By placing the rheostat in the electrical circuit, we can control (increase or decrease) the flow of electric current in the circuit. Rheostat reduces the electric current flow to certain level. However, it does not completely blocks the electric current flow. To completely block the electric current flow, we need infinite resistance. Practically it is not possible to completely block the electric current. The construction of rheostat is almost similar to the potentiometer. Like the potentiometer, the rheostat also consists of three terminals: terminal A, terminal B and terminal C. However, we use only two terminals: either A and B or B and C. Terminal A and terminal C are the two fixed terminals connected to both ends of the resistive element called track and terminal B is the variable terminal connected to the sliding wiper or slider. The wiper that moves along the resistive element varies the resistance of the rheostat. The resistance of the rheostat is changed when the slider or wiper is moved over the resistive path. The resistive element of the rheostat is made of a coil of wire or a thin carbon film. Rheostats are mostly wire wound. Hence, rheostats are also sometimes referred as variable wire wound resistors. Generally, rheostats are made by winding the Nichrome wire around an insulating ceramic core. The ceramic core of the rheostat acts as the insulating material to the heat. Hence, the ceramic core does not allow heat through it. The resistance of the rheostat is depends on the length of the resistive track through which electric current is flowing. If we use the terminals A and B in the rheostat, the minimum resistance is achieved when we move the slider or wiper close to the terminal A, because the length of the resistive path decreases. As a result, only a small amount of electric current is blocked and large amount of electric current is allowed. In the similar way, the maximum resistance is achieved when we move the slider close to terminal C, because the length of the resistive path increases. As a result, a large amount of electric current is blocked and only a small amount of electric current is allowed. If we use the terminals B and C, the minimum resistance is achieved when we move the slider or wiper close to the terminal C, because the length of the resistive path decreases. As a result, only a small amount of electric current is blocked and large amount of electric current is allowed. In the similar way, the maximum resistance is achieved when we move the slider close to terminal A, because the length of the resistive path increases. As a result, a large amount of electric current is blocked and only a small amount of electric current is allowed. Remember we are not reducing the resistance of the wire or resistive path; instead, we are just reducing the length of the resistive path to decrease the resistance. When we turn the outside knob with our hands, the wiper or slider moves along the resistive path. Rotary rheostat is also sometimes referred as circular rheostat because its resistive element looks like a circle. The resistive element of the rotary rheostat is circular or angled. In these types of resistors, the wiper or slider moves in a rotary manner. Rotary rheostats are used in most of the applications than the linear rheostats because their size is smaller than the linear rheostats. Linear rheostat is also sometimes referred as cylindrical rheostat because its resistive element looks like a cylinder. In these types of resistors, the wiper or slider moves in a linear manner. Linear rheostats are used in laboratories of doing research and teaching. The construction of both the potentiometer and rheostat is same. The main difference is the way we used it for operation. In potentiometers, we use all the three terminals for performing the operation whereas in rheostats, we use only two terminals for performing the operation. • Rheostat is generally used in the applications where high voltage or current is required. • Rheostats are used in dim lights to change the intensity of light. If we increase the resistance of the rheostat, the flow of electric current through the light bulb decreases. As a result, the light brightness decreases. In the similar way, if we decrease the resistance of the rheostat, the flow of electric current through the light bulb increases. As a result, the light brightness increases. • Rheostats are used to increase or decrease the volume of a radio and to increase or decrease the speed of an electric motor. A resistor is a type of passive component that restricts the flow of electric current to certain level. Resistors are mainly classified into two types: fixed resistors and variable resistors. Fixed resistor is a type of resistor that only restricts the flow of electric current but does not control (increase and decrease) the flow of electric current. On the other hand, variable resistor is a type of resistor that controls (increases and decreases) the flow of electric current by manually decreasing and increasing its resistance. In the fixed or variable resistors, if we manually set the resistance as constant, the resistance changes slightly as temperature increases or decreases. However, by using a special type of resistor we can rapidly change the resistance of the resistor with change in temperature. This special type of resistor is called thermistor. The demand for the precise components or devices (thermistors) is increased in the recent years. Thermistors measure the temperature accurately and work efficiently for years. Thermistor is a type of resistor whose resistance changes rapidly with the small change in temperature. In other words, it is a type of resistor in which the flow of electric current changes rapidly with small change in temperature. The word thermistor is derived from the combination of words “thermal” and “resistor”. The resistance of the NTC (Negative Temperature Co-efficient) thermistors decreases with increasing temperature. In other words, the electric current flow through the NTC (Negative Temperature Co-efficient) thermistors increases with the increase in temperature. Most of the NTC thermistors are made from a pressed disc, rod or cast chip of semiconductor material such as sintered metal oxides. In NTC thermistors, charge carriers are generated by doping process. Because of this doping process, a large number of charge carriers are generated. If the temperature is slightly increased, a large number of charge carriers (free electrons) collides with the valence electrons of other atoms and provides them sufficient energy. The valence electrons which gains sufficient energy will breaks the bonding with the parent atom and moves freely from one place to another place. The electrons that move freely from one place to another place are called free electrons. These electrons carry the electric current while moving from one place to another place. The valence electron, which becomes a free electron will again collide with the other valence electrons and makes them free. Likewise, a small increase in temperature produces millions of free electrons. More free electrons or charge carriers means more electric current. Thus, a small increase in temperature will rapidly decrease the resistance of NTC thermistor and allows a large amount of electric current. The resistance of Positive Temperature Co-efficient (PTC) thermistors increases with increase in temperature. Most of the Positive Temperature Co-efficient (PTC) thermistors are made from doped polycrystalline ceramic. 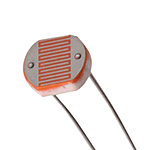 Thermistors with Positive Temperature Co-efficient (PTC) are also called posistors. The first NTC (Negative Temperature Co-efficient) thermistor was discovered by Michael Faraday in1833. Michael Faraday observed that the resistance of silver sulfide decreased rapidly when the temperature is increased. • The resistance of thermistors changes rapidly with small change in temperature. • It is easy to carry thermistors from one place to another place. • The resistance versus temperature characteristics is non-linear. • Thermistors are used in hot ends of 3d printers. • Thermistors are used in home appliances such as ovens, hair dryers, toasters, refrigerators, etc. • Modern coffee makers use thermistors to accurately measure and control water temperature. • Thermistors are used in computers. • Thermistors are used as temperature sensors. • Thermistors are used as inrush current limiter. The name photoresistor is the combination of words: photon (light particles) and resistor. A photoresistor is a type of resistor whose resistance decreases when the intensity of light increases. In other words, the flow of electric current through the photoresistor increases when the intensity of light increases. Photoresistors are also sometimes referred as LDR (Light Dependent Resistor), semiconductor photoresistor, photoconductor, or photocell. Photoresistor changes its resistance only when it is exposed to light. When the light falls on the photoresistor, some of the valence electrons absorbs energy from the light and breaks the bonding with the atoms. The valence electrons, which break the bonding with the atoms, are called free electrons. When the light energy applied to the photoresistor is highly increased, a large number of valence electrons gain enough energy from the photons and breaks the bonding with the parent atoms. The large number of valence electrons, which breaks the bonding with the parent atoms will jumps into the conduction band. The electrons present in the conduction band are not belongs to any atom. Hence, they move freely from one place to another place. The electrons that move freely from one place to another place are called free electrons. When the valence electron left the atom, a vacancy is created at a particular location in an atom from which the electron left. This vacancy is called as hole. Therefore, the free electrons and holes are generated as pairs. The free electrons that are moving freely from one place to another place carry the electric current. In the similar way, the holes moving in the valence band carry electric current. Likewise, both free electrons and holes will carry electric current. The amount of electric current flowing through the photoresistor is depends on the number of charge carriers (free electrons and holes) generated. When the light energy applied to the photoresistor increases, the number of charge carriers generated in the photoresistor also increases. As a result, the electric current flowing through the photoresistor increases. Increase in electric current means decrease in resistance. Thus, the resistance of the photoresistor decreases when the intensity of applied light increases. Photoresistors are made of high resistance semiconductor such as silicon or germanium. They are also made of other materials such as cadmium sulfide or cadmium selenide. In the absence of light, the photoresistors acts as high resistance materials whereas in the presence of light, the photoresistors acts as low resistance materials. Intrinsic photoresistors are made from the pure semiconductor materials such as silicon or germanium. The outermost shell of any atom is capable to hold up to eight valence electrons. However, in silicon or germanium, each atom consists of only four valence electrons. These four valence electrons of each atom form four covalent bonds with the neighboring four atoms to completely fill the outermost shell. As a result, no electron is left free. When we apply light energy to the intrinsic photo resistor, only a small number of valence electrons gain enough energy and becomes free from the parent atom. Hence, a small number of charge carriers are generated. As a result, only a small electric current flows through the intrinsic photo resistor. We already have known that increase in electric current means decrease in resistance. In intrinsic photoresistors, the resistance decreases slightly with the increase in light energy. Hence, intrinsic photoresistors are less sensitive to the light. Therefore, they are not reliable for the practical applications. Extrinsic photoresistors are made from the extrinsic semiconductor materials. Let us consider an example of extrinsic photoresistor, which is made from the combination of silicon and impurity (phosphorus) atoms. Each silicon atom consists of four valence electrons and each phosphorus atom consists of five valence electrons. The four valence electrons of the phosphorus atom form four covalent bonds with the neighboring four silicon atoms. However, the fifth valence electron of the phosphorus atom cannot able to form the covalent bond with the silicon atom because the silicon atom has only four valence electrons. Hence, the fifth valence electron of each phosphorus atom becomes free from the atom. Thus, each phosphorus atom generates a free electron. The free electron, which is generated will collides with the valence electrons of other atoms and makes them free. Likewise, a single free electron generates multiple free electrons. Therefore, adding a small number of impurity (phosphorus) atoms generates millions of free electrons. In extrinsic photoresistors, we already have large number of charge carriers. Hence, providing a small amount of light energy generates even more number of charge carriers. Thus, the electric current increases rapidly. Increase in electric current means decrease in resistance. Therefore, the resistance of the extrinsic photoresistor decreases rapidly with the small increase in applied light energy. Extrinsic photoresistors are reliable for the practical applications. • Photoresistors are used in streetlights to control when the light should turn on and when the light should turn off. When the surrounding light falls on the photo resistor, it causes the streetlight to turnoff. When there is no light, the photoresistor causes the street light to turn on. This reduces the wastage of electricity. • They are also used in various devices such as alarm devices, solar street lamps, night-lights, and clock radios. • It is easy to carry from one place to another place. • The accuracy of photoresistor is very low. The name humistor is obtained from the combination of words: humidity and resistor. Humistor is very sensitive to the humidity. Therefore, it is used as a sensor for measuring the humidity in the surrounding air. A humistor is a type of variable resistor whose resistance changes with the change in humidity of the surrounding air. Humistors are also sometimes referred as humidity sensitive resistor or resistive humidity sensor. Humidity is the amount of gaseous water or water vapor present in the air. Humistor is generally made of an organic polymer such as polyamide resin, polyethylene, or a metal oxide. The resistance of the humistor is depends on the concentration of absorbed water molecules. When the humidity increases, the water molecules absorbed by the humistor increases and the humistor becomes more electrically conductive. As a result, the resistance of the humistor decreases. On the other hand, when the humidity decreases, the water molecules absorbed by the humistor decreases and humistor becomes less electrically conductive. As a result, the resistance of the humistor increases. Likewise, the humistor detects and measures the change in humidity. • The resistance of the humistor varies non-linearly with the change in humidity. 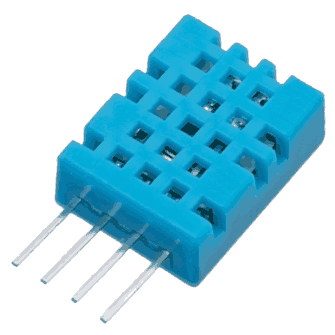 The DHT11 is a basic, low cost digital temperature and humidity sensor. DHT11 is a single wire digital humidity and temperature sensor, which provides humidity and temperature values serially with one-wire protocol. DHT11 sensor provides relative humidity value in percentage (20 to 90% RH) and temperature values in degree Celsius (0 to 50 °C). 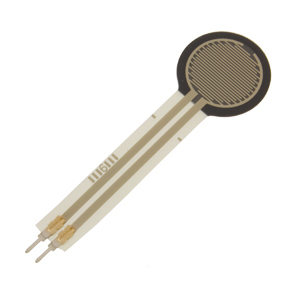 DHT11 sensor uses resistive humidity measurement component, and NTC temperature measurement component. DHT11 uses only one wire for communication. The voltage levels with certain time value defines the logic one or logic zero on this pin. The communication process is divided in three steps, first is to send request to DHT11 sensor then sensor will send response pulse and then it starts sending data of total 40 bits to the microcontroller. After getting start pulse from, DHT11 sensor sends the response pulse which indicates that DHT11 received start pulse. After sending the response pulse, DHT11 sensor sends the data, which contains humidity and temperature value along with checksum. The data frame is of total 40 bits long, it contains 5 segments (byte) and each segment is 8-bit long. In these 5 segments, first two segments contain humidity value in decimal integer form. This value gives us Relative Percentage Humidity. 1st 8-bits are integer part and next 8 bits are fractional part. Next two segments contain temperature value in decimal integer form. This value gives us temperature in Celsius form. Last segment is the checksum which holds checksum of first four segments. Here checksum byte is direct addition of humidity and temperature value. And we can verify it, whether it is same as checksum value or not. If it is not equal, then there is some error in the received data. Once data received, DHT11 pin goes in low power consumption mode till next start pulse. After sending 40-bit data, DHT11 sensor sends 54us low level and then goes high. After this DHT11 goes in sleep mode. Crocodiles are large reptiles found in tropical regions of Africa, Asia, the Americas and Australia. They are members of the order Crocodilia, which also includes caimans, gharials and alligators. There are 13 species of crocodiles, so there are many different sizes of crocodile. The smallest crocodile is the dwarf crocodile. It grows to about 5.6 feet (1.7 meters) in length and weighs 13 to 15 pounds (6 to 7 kilograms). The largest crocodile is the saltwater crocodile. The largest one ever found was 20.24 feet (6.17 m) long. They can weigh up to 2,000 pounds (907 kg). Crocodiles are carnivores, which mean they eat only meat. In the wild, they feast on fish, birds, frogs and crustaceans. At the zoo, they eat small animals that have already been killed for them, such as rats, fish or mice. They also eat live locusts. In the wild, crocodiles will clamp down on their prey with their massive jaws, crush it, and then they will swallow the prey whole. They do not have the capability to chew or break off small pieces of food like other animals. To help with digestion, crocodiles swallow small stones that grind up the food in their stomachs. Thanks to their slow metabolisms, crocodiles can survive for months without food. During the Mesozoic Era, about 100 million years ago, the Crocodilia order was one of the top animals on the food chain. Today, crocodiles are found in the tropical habitats of Africa, Asia, Australia and the Americas. They normally live near lakes, rivers, wetlands and even some saltwater regions. One of the largest known populations of American crocodiles is found in the Dominican Republic's at a large saltwater lake called Lago Enriquillo, according to National Geographic. Crocodiles live in tropical climates for a reason. They are cold-blooded and cannot generate their own heat. During colder months, they hibernate or go dormant. Crocodiles will also go dormant during long periods of drought. To create a place to hibernate, they dig out a burrow in the side of river bank or lake and settle in for a long sleep. Crocodiles lay 10 to 60 eggs at a time. The hatchlings stay in their eggs for 55 to 110 days. They are 7 to 10 inches (17.8 to 25.4 centimeters) long when they are born and don't mature until they are 4 to 15 years. How long a crocodile lives depends on its species. Some only live to around 30 years, while others live up to 75 years. Crocodiles are often confused with alligators, but there are some easy-to-spot differences. An alligator's jaw is U-shaped, while a crocodile has a V-shaped jaw, according to the San Diego Zoo. Crocodiles also have teeth that stick up over their upper lip when their mouths are closed. Another difference between alligators and crocodiles is that crocs have salt glands on their tongues. These modified salivary glands help crocs tolerate living in salt water. Alligators and caimans have lost the ability to secrete excess salt through the tongue glands and therefore, they prefer to live in freshwater areas. Crocodiles don't sweat. To keep cool, they open their mouths in a process that is called "mouth gaping," which is a lot like panting. "Crying crocodile tears" refers to a person expressing insincere remorse. It is a saying that goes back to about the 16th century. Crocodiles DO produce tears. Their lachrymal glands secrete a fluid behind their third eyelid, called a nictitating membrane. The fluid helps clean the eye, lubricate it and reduce bacteria. Crocodile tears aren't usually noticeable unless the croc has been out of the water for a while and the eyes begin to dry out. A crocodile's jaws can apply 5,000 pounds of pressure per square inch. This means that they can bite through an arm or a leg with no problem. A human's jaw only produces 100 pounds of pressure per square inch. The crocodile jaw has very little opening strength, though. For example, a crocodile's mouth can be held shut with a rubber band. In addition to their strong jaws, crocodiles also have very keen hearing. It is so good, they can hear their babies calling from inside their egg. Crocodiles are very fast swimmers, which helps them catch their prey. They can swim up to 20 mph (32 kph) and can hold their breath underwater for around one hour. On land, crocodiles aren't nearly as fast. They can only run up to 11 mph (17.6 kph) for a short distance. It is illegal to hunt crocodiles for their skin. This makes their skin very rare. Thanks to their slow metabolisms, crocodiles can survive for months without food. But unlike snakes, it isn't safe to be in close proximity with a full-stomached crocodile, right? A crocodile’s physical traits allow it to be a successful predator. Its external morphology is a sign of its aquatic and predatory lifestyle. Its streamlined body enables it to swim swiftly; it also tucks its feet to the side while swimming, making it faster by decreasing water resistance. Crocodiles have webbed feet which, though not used to propel them through the water, allow them to make fast turns and sudden moves in the water or initiate swimming. Webbed feet are an advantage in shallow water, where the animals sometimes move around by walking. Crocodiles have a palatal flap, a rigid tissue at the back of the mouth that blocks the entry of water. The palate has a special path from the nostril to the glottis that bypasses the mouth. The nostrils are closed during submergence. Since they feed by grabbing and holding onto their prey, they have evolved sharp teeth for piercing and holding onto flesh, and powerful muscles to close the jaws and hold them shut. The teeth are not well-suited to tearing flesh off of large prey items as are the dentition and claws of many mammalian carnivores, the hooked bills and talons of raptorial birds, or the serrated teeth of sharks. However, this is an advantage rather than a disadvantage to the crocodile since the properties of the teeth allow it to hold onto prey with the least possibility of the prey animal escaping. Cutting teeth, combined with the exceptionally high bite force, would pass through flesh easily enough to leave an escape opportunity for prey. The jaws can bite down with immense force, by far the strongest bite of any animal. 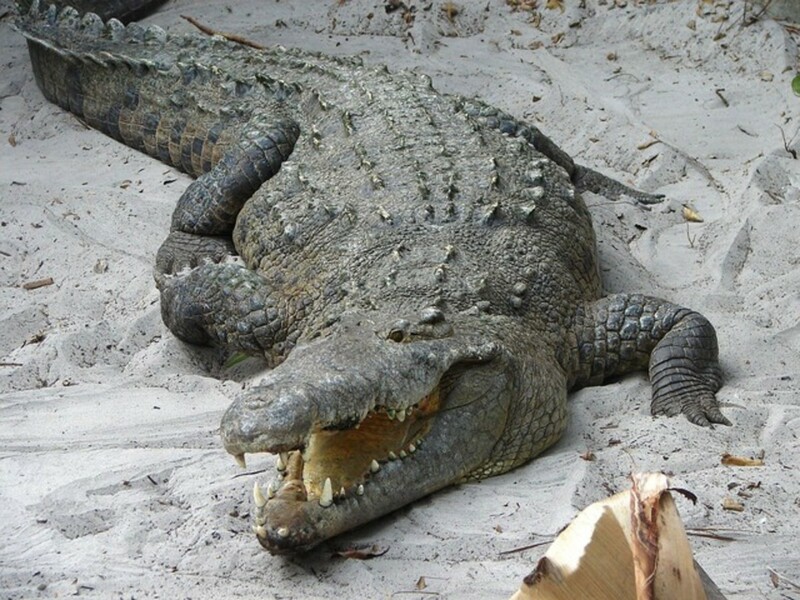 The force of a large crocodile's bite is more than 5,000 lbf (22,000 N), which was measured in a 5.5 m (18 ft) Nile crocodile, in the field; comparing to 335 lbf (1,490 N) for a Rottweiler, 800 lbf (3,600 N) for a hyena, 2,200 lbf (9,800 N) for an American alligator,[not in citation given] and 4,095 lbf (18,220 N) for the largest confirmed great white shark.A 5.2 m (17 ft) long saltwater crocodile has been confirmed as having the strongest bite force ever recorded for an animal in a laboratory setting. It was able to apply a bite force value of 3,700 lbf (16,000 N), and thus surpassed the previous record of 2,125 lbf (9,450 N) made by a 3.9 m (13 ft) long American alligator. Taking the measurements of several 5.2 m (17 ft) crocodiles as reference, the bite forces of 6-m individuals were estimated at 7,700 lbf (34,000 N). The study, led by Dr. Gregory M. Erickson, also shed light on the larger, extinct species of crocodilians. Since crocodile anatomy has changed only slightly over the last 80 million years, current data on modern crocodilians can be used to estimate the bite force of extinct species. An 11-to-12-metre (36–39 ft) Deinosuchus would apply a force of 23,100 lbf (103,000 N), nearly twice that of the latest, higher bite force estimations of Tyrannosaurus (12,814 lbf (57,000 N)). The extraordinary bite of crocodilians is a result of their anatomy. The space for the jaw muscle in the skull is very large, which is easily visible from the outside as a bulge at each side. The muscle is so stiff, it is almost as hard as bone to touch, as if it were the continuum of the skull. Another trait is that most of the muscle in a crocodile's jaw is arranged for clamping down. Despite the strong muscles to close the jaw, crocodiles have extremely small and weak muscles to open the jaw. Crocodiles can thus be subdued for study or transport by taping their jaws or holding their jaws shut with large rubber bands cut from automobile inner tubes. Are those stones also digested? A gastrolith, also called a stomach stone or gizzard stone, is a rock held inside a gastrointestinal tract. Gastroliths in some species are retained in the muscular gizzard and used to grind food in animals lacking suitable grinding teeth. In other species the rocks are ingested and pass through the digestive system and are frequently replaced. The grain size depends upon the size of the animal and the gastrolith's role in digestion. Other species use gastroliths as ballast. Particles ranging in size from sand to cobble have been documented. Among living vertebrates, gastroliths are common among crocodiles, alligators, herbivorous birds, seals and sea lions. Domestic fowl require access to grit. Stones swallowed by ostriches can exceed a length of 10 centimetres (3.9 in). Amphibians such as the Axolotl are also known to deliberately ingest rocks that are presumed to be gastroliths. Apparent microgastroliths have also been found in frog tadpoles. Ingestion of silt and gravel by tadpoles of various anuran (frog) species has been observed to improve buoyancy control. Some extinct animals such as sauropod dinosaurs appear to have used stones to grind tough plant matter. A rare example of this is the Early Cretaceous theropod Caudipteryx zoui from northeastern China, which was discovered with a series of small stones, interpreted as gastroliths, in the area of its skeleton that would have corresponded with its abdominal region. Aquatic animals, such as plesiosaurs, may have used them as ballast, to help balance themselves or to decrease their buoyancy, as crocodiles do. While some fossil gastroliths are rounded and polished, many stones in living birds are not polished at all. Gastroliths associated with dinosaur fossils can weigh several kilograms. As the name implies, the force sensitive resistors are very sensitive to the applied force. When we apply force to the force sensitive resistor, its resistance changes rapidly. A force sensitive resistor is a type of variable resistor whose resistance decreases when the applied force increases. Force sensitive resistors are also known as force sensing resistors, FSR, force sensor, or pressure sensor. The force sensitive resistor consists of conductive polymer whose resistance changes when the force is applied. It is normally supplied as polymer sheet or ink that can be applied by a technique called screen-printing. Screen-printing is a technique used to transfer ink into a substrate. The sensing film consists of both electrically non-conducting and conducting particles suspended in matrix. When the force is applied, the sensing film causes particles to touch the conducting electrodes. As a result, the resistance of the film decreases. The resistance of the force sensitive resistor is depends on the amount of force applied. If large amount of force is applied, the resistance of the force sensitive resistor decreases and provides low resistance to the electric current. On the other hand, if little force or no force is applied to the force sensitive resistor, the resistance remains same and provides high resistance to the electric current. In 1972, Franklin Eventoff started developing a series of musical instrument controllers. Five years later (1977), he invented the force-sensing resistor or force sensitive resistor. In 1985, Franklin Eventoff founded Interlink Electronics, a company based on his invention, force-sensing resistor. • Musical instruments: In musical instruments, the force sensitive resistors are used to translate the emotions of a person into musical expressions through his touch. • Computer input devices: Force sensitive resistors are used to control the force and speed of the cursor movement. • Industrial applications: Force sensitive resistors are used in brakes, seat occupancy detection, motor speed control and mirror adjustor. The technology of force-sensing resistors was invented and patented in 1977 by Franklin Eventoff. In 1985 Eventoff founded Interlink Electronics, a company based on his force-sensing-resistor (FSR). In 1987, Eventoff was the recipient of the prestigious international IR 100 award for the development of the FSR. In 2001 Eventoff founded a new company, Sensitronics, that he currently runs. Force-sensing resistors consist of a conductive polymer, which changes resistance in a predictable manner following application of force to its surface. They are normally supplied as a polymer sheet or ink that can be applied by screen printing. The sensing film consists of both electrically conducting and non-conducting particles suspended in matrix. The particles are sub-micrometre sizes, and are formulated to reduce the temperature dependence, improve mechanical properties and increase surface durability. Applying a force to the surface of the sensing film causes particles to touch the conducting electrodes, changing the resistance of the film. As with all resistive based sensors, force-sensing resistors require a relatively simple interface and can operate satisfactorily in moderately hostile environments. Compared to other force sensors, the advantages of FSRs are their size (thickness typically less than 0.5 mm), low cost and good shock resistance. A disadvantage is their low precision: measurement results may differ 10% and more. Force-sensing capacitors offer superior sensitivity and long term stability, but require more complicated drive electronics. Elephants are the largest land animals on Earth. They have characteristic long noses, or trunks; large, floppy ears; and wide, thick legs. There are two species of elephant. The Asian elephant and the African elephant live on separate continents and have many unique features. There are several subspecies that belong to one or the other of these two main species, though there is disagreement over just how many subspecies there are. African elephants are the larger of the two species. They grow 8.2 to 13 feet (2.5 to 4 meters) from shoulder to toe and weigh 5,000 to 14,000 lbs. (2,268 to 6,350 kilograms), according to the National Geographic. Asian elephants can grow up to 6.6 to 9.8 feet (2 to 3 m) from shoulder to toe and weigh up to 2.25 to 5.5 tons (2,041 to 4,990 kg). African elephants live in sub-Saharan Africa, the rain forests of Central and West Africa and the Sahel desert in Mali. Asian elephants live in Nepal, India and Southeast Asia in scrub forests and rain forests. Elephants eat grasses, roots, fruit and bark. They use their tusks to pull the bark from trees and dig roots out of the ground. An elephant has an appetite that matches its size. An adult can eat 300 lbs. (136 kg) of food in a day, according to the National Geographic. A group of elephants is called a herd. The herd is led by a matriarch, which is the oldest female. Females, as well as young and old elephants, stick together in a herd. Adult males tend to wander on their own. Elephants also have certain rules. For example, when they are meeting each other, they expect the other elephant to extend its trunk in greeting. The matriarch will often teach young elephants in her herd how to act properly. Another possible subspecies is Elephas maximus borneensis (Borneo pygmy elephant). The World Wildlife Fund has determined that DNA evidence proves that the Borneo pygmy elephantis genetically different from other Asian elephants. According to the Red List of Threatened Species of the International Union for Conservation of Nature (IUCN), the Asian elephant is endangered. Though it is not known exactly how many Asian elephants remain, it is believed that the population is decreasing. The African elephant is considered vulnerable. Overall, its populations are increasing. According to the African Wildlife Foundation, there are around 470,000 African elephants roaming the globe. The African elephant can be identified by its ears. Stretched out, its ears are shaped like the African continent. Asian elephants have smaller ears, which are more rounded on top and flat along the bottom. Heat radiates out of the elephant's massive ears, acting as a cooling mechanism. The largest elephant ever recorded was an African elephant, according to the San Diego Zoo. It was 24,000 lbs. (10,886 kg) and 13 feet (3.96 m) tall from its feet to its shoulders. When it gets too hot, African elephants will drag water into their trunks and then blow it back out to shower themselves with a cool mist. An elephant's trunk has more than 100,000 muscles, according to National Geographic. They use it to breathe, pick things up, make noises, drink and smell. In the same way that humans tend to be right-handed or left-handed, elephants can be right-tusked or left-tusked. Their dominant tusk is easy to identify, because it will be more worn down than the less dominant tusk, according to the World Wildlife Fund. An elephant's skin can be as thick as 1 inch, but it is sensitive to the sun. To protect it, elephants will cover themselves in mud or dust. The elephants are the large mammals forming the family Elephantidae in the order Proboscidea. Three species are currently recognised: the African bush elephant (Loxodonta africana), the African forest elephant (L. cyclotis), and the Asian elephant (Elephas maximus). Elephants are scattered throughout sub-Saharan Africa, South Asia, and Southeast Asia. Elephantidae is the only surviving family of the order Proboscidea; other, now extinct, members of the order include deinotheres, gomphotheres, mammoths, and mastodons. Elephant trunks have multiple functions, including breathing, olfaction, touching, grasping, and sound production. The animal's sense of smell may be four times as sensitive as that of a bloodhound. The trunk's ability to make powerful twisting and coiling movements allows it to collect food, wrestle with other elephants, and lift up to 350 kg (770 lb). It can be used for delicate tasks, such as wiping an eye and checking an orifice, and is capable of cracking a peanut shell without breaking the seed. With its trunk, an elephant can reach items at heights of up to 7 m (23 ft) and dig for water under mud or sand. Individuals may show lateral preference when grasping with their trunks: some prefer to twist them to the left, others to the right. Elephants can drag up water both to drink and to spray on their bodies. An adult Asian elephant is capable of holding 8.5 L (2.2 US gal) of water in its trunk. They will also spray dust or grass on themselves. When underwater, the elephant uses its trunk as a snorkel. Like humans, who are typically right- or left-handed, elephants are usually right- or left-tusked. The dominant tusk, called the master tusk, is generally more worn down, as it is shorter with a rounder tip. For the African elephants, tusks are present in both males and females, and are around the same length in both genders, reaching up to 3 m (10 ft), but those of males tend to be thicker. In earlier times, elephant tusks weighing over 200 pounds (more than 90 kg) were not uncommon, though it is rare today to see any over 100 pounds (45 kg). An elephant's skin is generally very tough, at 2.5 cm (1 in) thick on the back and parts of the head. The skin around the mouth, math, and inside of the ear is considerably thinner. Elephants typically have grey skin, but African elephants look brown or reddish after wallowing in coloured mud. Asian elephants have some patches of depigmentation, particularly on the forehead and ears and the areas around them. Calves have brownish or reddish hair, especially on the head and back. As elephants mature, their hair darkens and becomes sparser, but dense concentrations of hair and bristles remain on the end of the tail as well as the chin, and the areas around the eyes and ear openings. Normally the skin of an Asian elephant is covered with more hair than its African counterpart. So, if people shake hands, elephants shake noses? In #347 (edited), more information has been provided.